FINALIST and SECOND RUNNER UP for the Audience Award in the Star Wars Fan Film Awards! 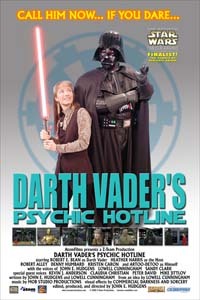 Darth Vader's Psychic Hotline is a parody of the whole Miss Cleo/Psychic Friends Network thing, but done with a Star Wars twist, with various characters calling "D.V." with their problems and wanting advice... but is it really what they want to hear?